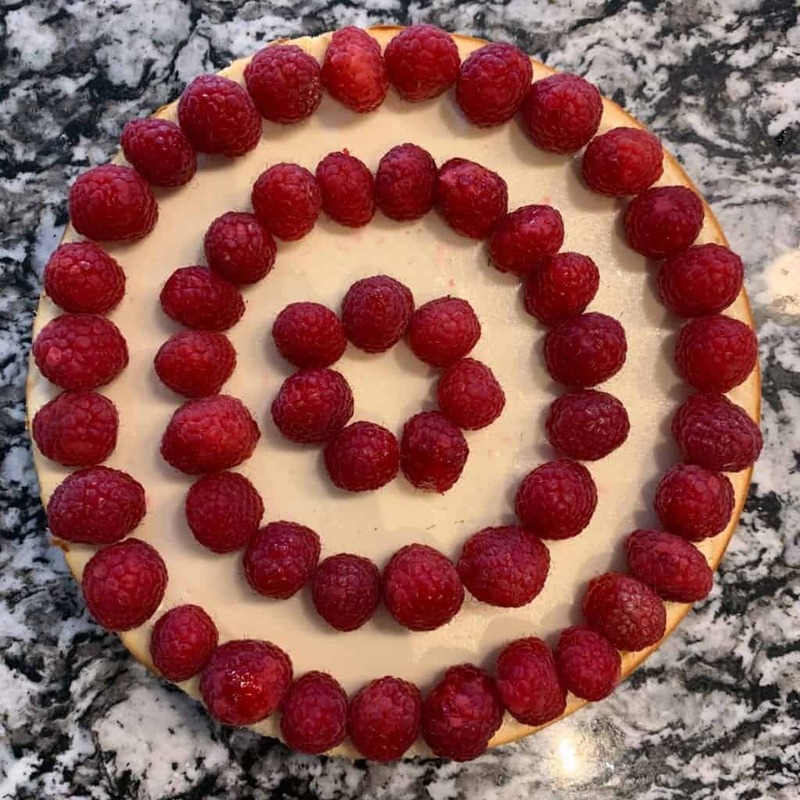 “Welcome to the top 5 desserts on my blog.” That’s what I said right after taking a bite of this protein cheesecake yesterday. And if you don’t talk to your food, are you really eating? 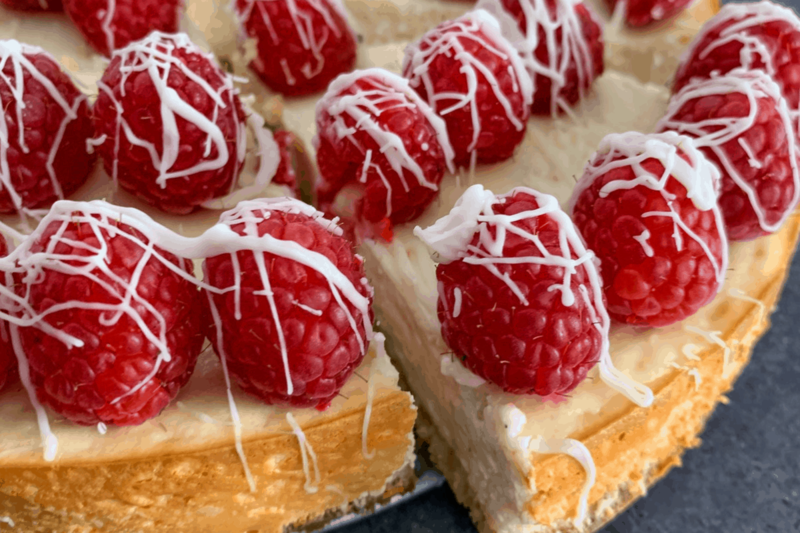 Seriously, the contrast between the real white chocolate and fresh raspberries and perfectly creamy cheesecake with the buttery crust will blow you away. You’ll never believe one slice has nearly 20 grams of protein! I always like to start with a quick walkthrough of the ingredients and answer common questions about substitutions. The crust ingredient list is pretty straightforward. If you wanted to use all purpose flour, I’d swap the 112 grams of almond for 120 grams of all purpose (1 Cup). And if you wanted to use real butter or another fat source like coconut oil, feel free. I buy my fat free cream cheese at Walmart and/or Kroger but if you can’t find it, you can use 1/3 fat without any modifications. 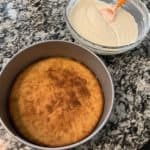 For this protein cheesecake, I used Bowmar Nutrition Frosted Cookie Protein Powder. For comparison, it’s a whey protein with 120 calories, 22 grams of protein, 2 grams of carbs, 1 gram of fat, and a flavor profile similar to vanilla. Like I mentioned in my low carb skillet cookie recipe, the most important thing to keep in mind when using other protein powders, aside from the type of protein itself, is scoop size. A scoop of Protein Frosted Cookie weighs 28 grams, and you’ll need 3 scoops for a total of 84 grams. If you use a protein with a 35-gram scoop, that’s a 21-gram difference over 3 scoops and will definitely affect the outcome. 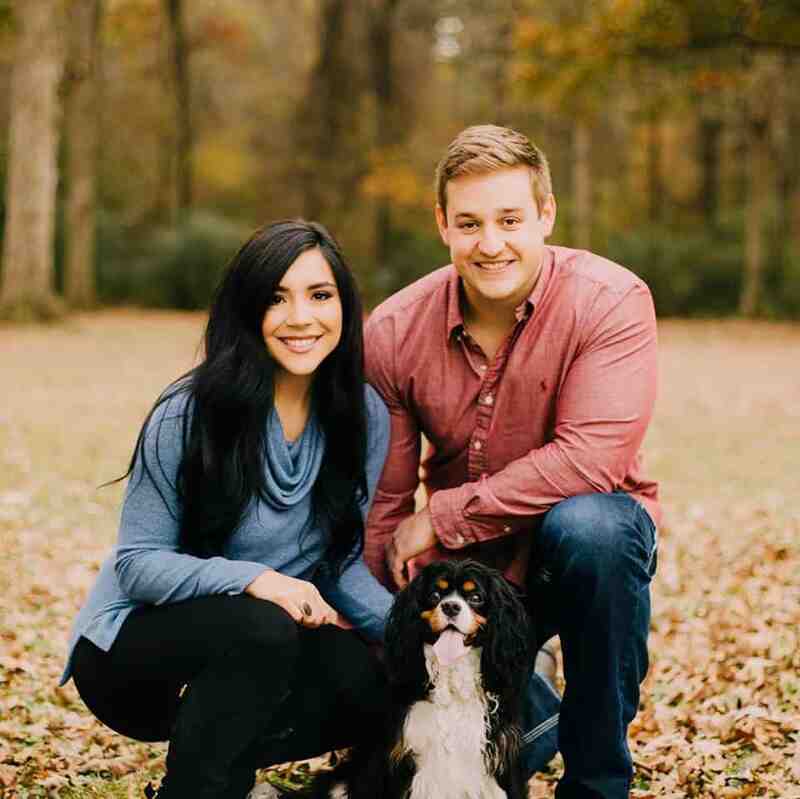 Use any brands for these two. I used Chobani and Ghirardelli. Okay, I think that wraps up the ingredients section. I’ll leave you with a few final tips below. Line a pan or dish with parchment paper so you can easily remove the cheesecake after it cools. If you don’t need to show it off, serve your protein cheesecake straight from the tin you bake it in. Use a disposable pie pan or something similar. 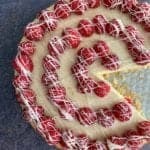 While this protein cheesecake has white chocolate chips inside the cheesecake itself, you could certainly get creative with the toppings. 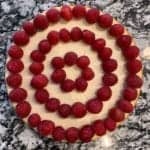 If you’ve tried my white chocolate strawberry protein cake bars, you know strawberries are a great sub for raspberries. And you could get away from berries altogether with something like pistachios or coconut. Have fun! 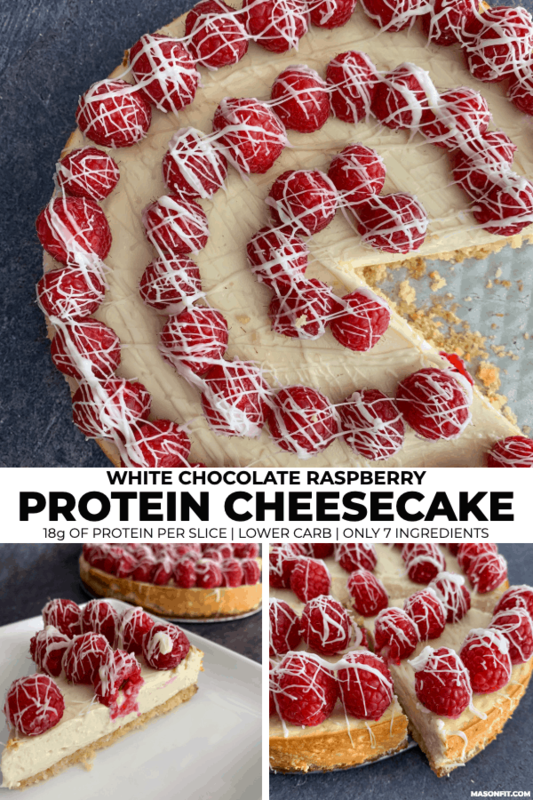 If you get creative, I’d love to see your spin on this protein cheesecake. Snap a pic and tag me on Instagram @mason_woodruff. Or you can join my free Facebook group and share it with the Proton Party. 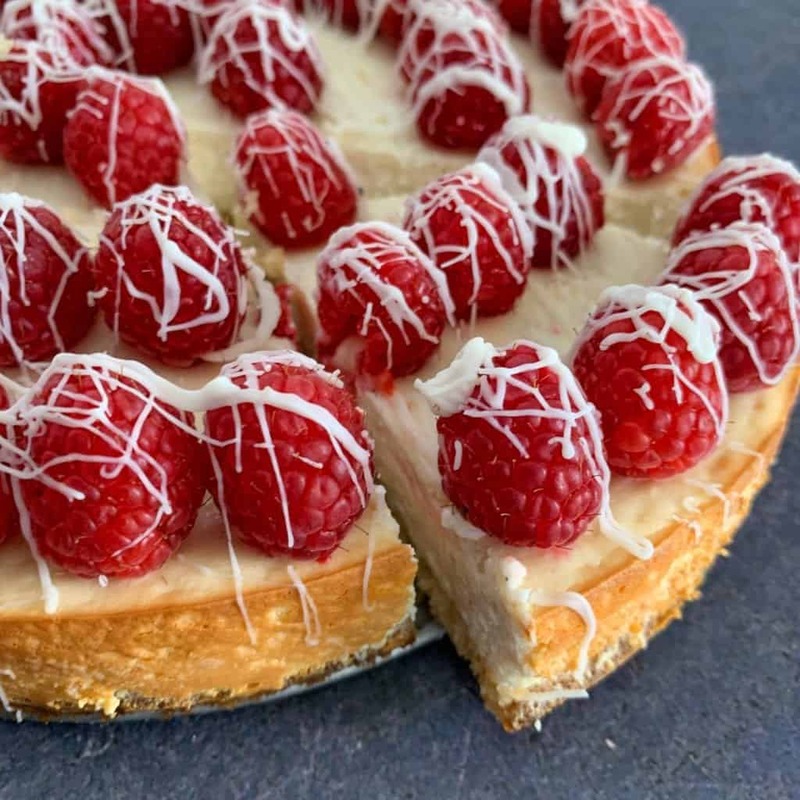 A high protein vanilla cheesecake on a 3-ingredient buttery crust and topped with fresh raspberries and melted white chocolate. 1/4 C (48g) Granular Sugar Substitute stevia, Swerve granular, etc. Preheat an oven to 400F and spray the bottom of a 7" springform pan with nonstick cooking spray. 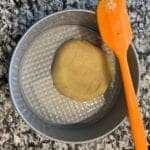 Mix the crust ingredients together in a bowl until you can form a ball of dough. Add the dough to the pan. 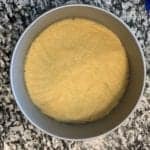 Use a rubber spatula or your fingers to press the crust dough to the edges of the pan. Do your best to not leave any gaps between the edge of the pan and the crust. Bake the crust for 11-13 minutes or until the top begins to turn golden brown. While the crust bakes, add the cream cheese and white chocolate chips to a large bowl and microwave for 30-60 seconds or until you can fully mix the two together. Add the Greek yogurt and protein powder, stirring well. Once the crust has baked, spray the edges of the springform pan with a bit more cooking spray and add the cheesecake mixture. Use a spatula to smooth the surface or gently shake the pan to create an even surface. 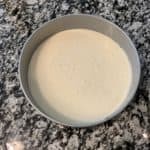 Reduce the oven temperature to 350F and bake for an additional 23-25 minutes or until the center is mostly set, unlike a traditional cheesecake. Let the cheesecake cool to room temp before running a knife around the edges (to prevent breaking apart as it cools further) and refrigerate for at least 3-4 hours. 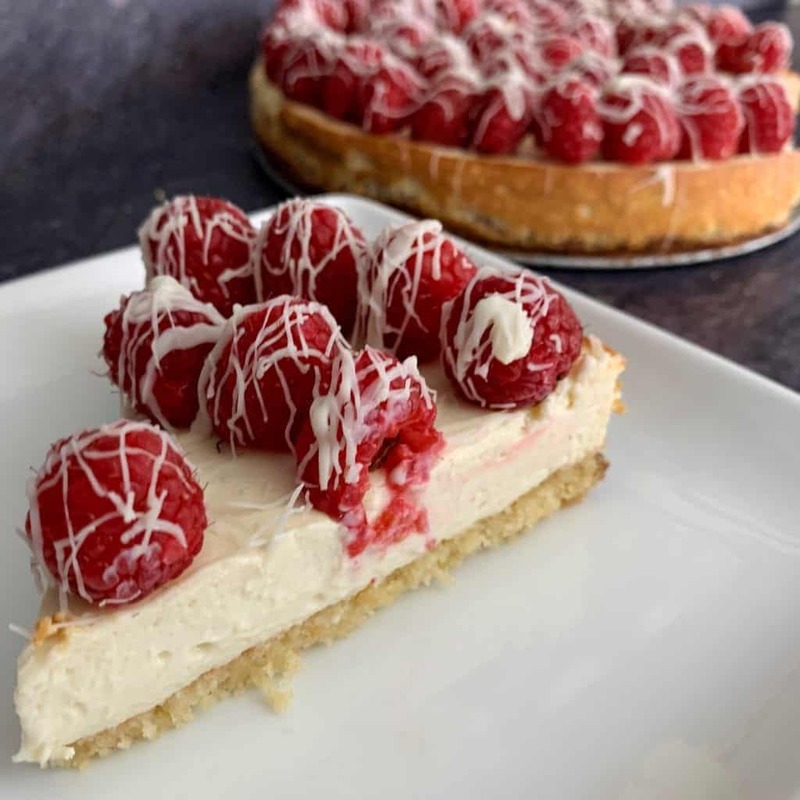 Top the protein cheesecake with fresh raspberries and melt an additional 2 tablespoons of white chocolate chips to drizzle over the top of the cheesecake, if desired. 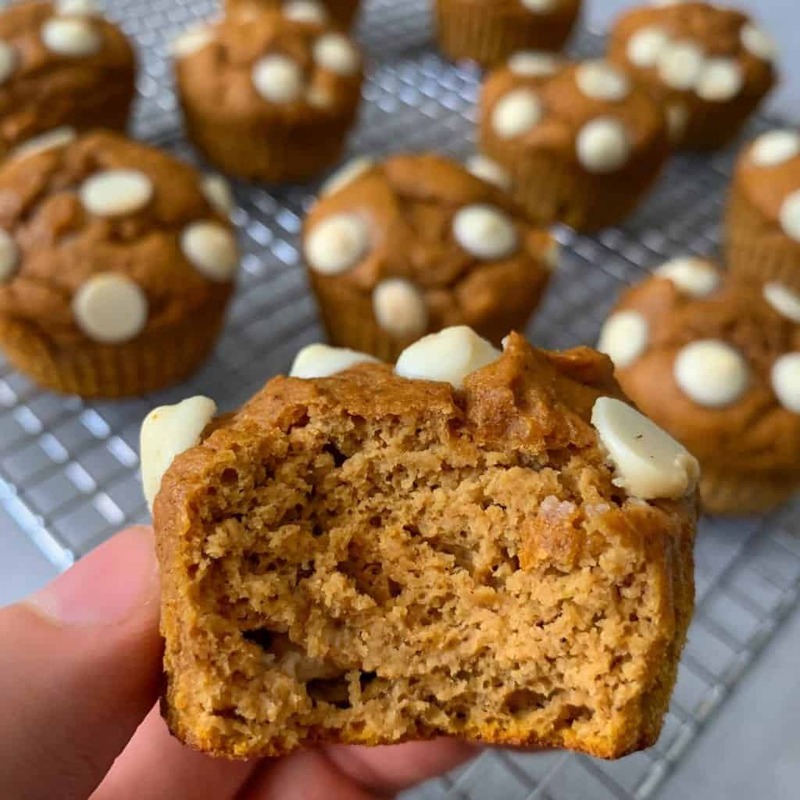 My white chocolate pumpkin protein muffins have 7 grams of protein and 13 grams of carbs a piece. And they only call for 6 ingredients. 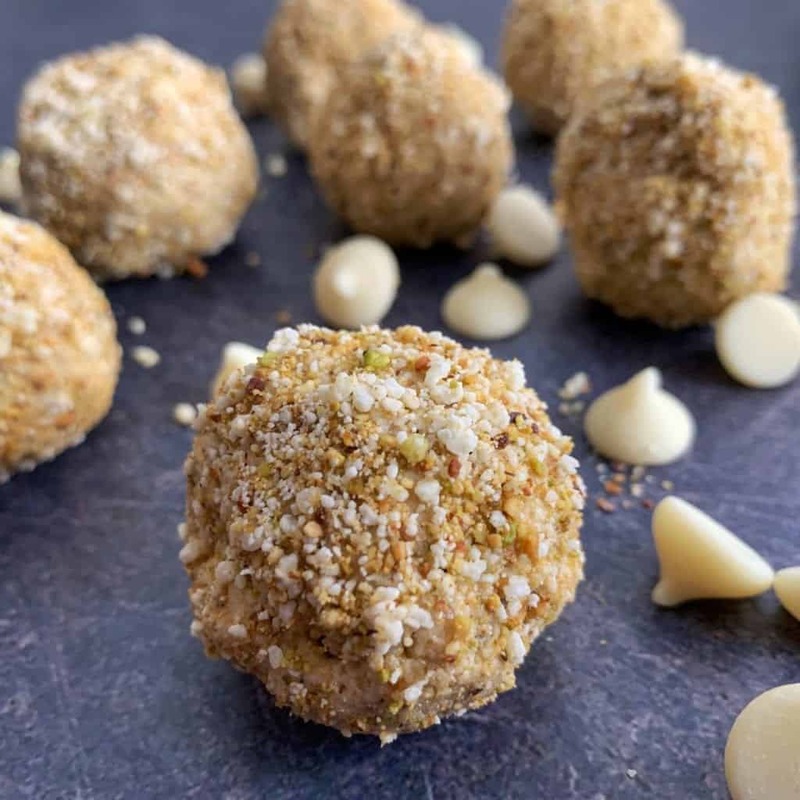 And these no bake white chocolate pistachio protein bites are one of my all time favorite no bake recipes. Made this for valentines! HOLY CANNOLI. So delish. Just made this tonight and I have to say this is one of the best protein packed desserts I have ever had. I made this recipe with a few variations and still had to hide it from myself. I skipped the crust altogether to save some macros, used frozen raspberries bc they were cheaper this time of year and I didn’t melt the 2 tbsp of what chips I just sprinkled them on top with the frozen raspberries. Still amazing! I have been eating a slice every night since I made it!!! This was perfect. I have tried it with Pe science gourmet vanilla and with bowmar nutritions’s blueberry cheesecake. Both worked well and made for an awesome dessert treat. So good! I used Protein Blueberry Cheesecake and topped with blueberries. I only had a 9-inch pan so I 1 1/2’ed the ingredients then divided the cheesecake into 12 slices to keep the macros the same as the original recipe. I will definitely make this again. Everyone who tried it enjoyed it.